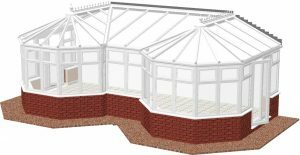 What is a P shape Conservatory? What they all have in common is that they are a combination of at least 2 different conservatory designs. 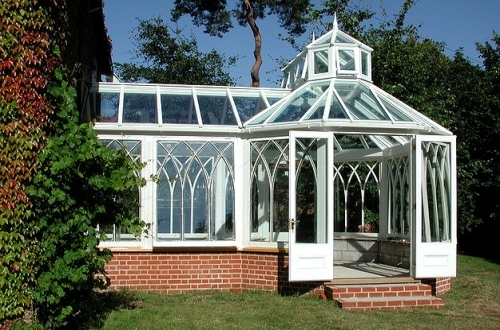 In the case of a P-shape conservatory, one of the designs used would most often be a Victorian. 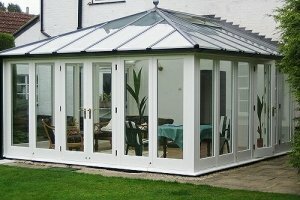 What do P shape Conservatories look like? The “P” refers to how the conservatory can resemble that letter when viewed from overhead, giving the conservatory one longer straight side and one curved part. Victorian conservatories are invariably used for the curved or rounded element of a P shaped conservatory. However, the other section (which I will refer to as the “leg” of the letter) could be a Lean-to or even Edwardian. The use of Edwardian or Lean-to is probably going to be influenced by the roof design that you prefer. The Victorian conservatory element can have a big influence on styling, in that Victorian conservatories are usually quite ornate. 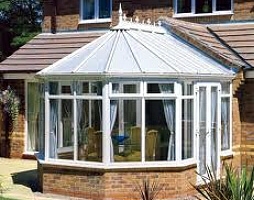 That ornate styling would tend to carry through to the overall appearance of a P- shaped conservatory. 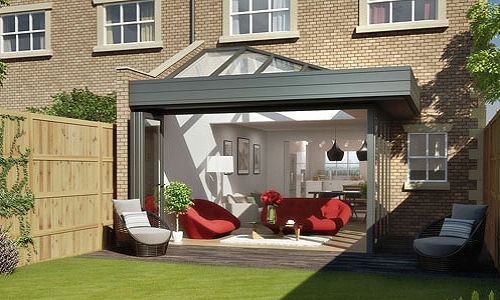 Many conservatories of this design make use of low level dwarf walls. Brick is popular, but you could use block, stone or cement render to give a different look & feel to the room. As with other bespoke conservatories, combining different styles into one new design can give your home a real uplift in appeal and value. This type of conservatory style is really a “double P” in that you could have a Victorian design at both ends and these would be connected by a Lean-to or Edwardian centre section. It does make for a very complex roof, and you will need a decent amount of space in which to build, otherwise the design may look quite cramped and lose its; appeal. A T-shape can be a square version of a P-shaped, where a Gable, Edwardian, Georgian or other rectangular design is use in place of the Victorian element. With this design a lean-to can very often be the top of the T, and Gable, Georgian or Edwardian used as the “leg”. An L-shape conservatory can be used either to go into a corner or wrap around a corner as well as project out from the property. 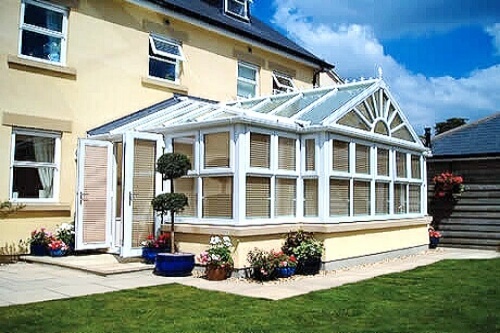 They are sometimes referred to as “corner conservatories”. This design can make use of almost any design, but, if you use a Victorian section then it effectively becomes a P-shape. Apart from being used for corners, the long section can be seen most often against the wall of the home and the short section to project away. However, if you have the room, you could reverse this and have the longer section project away from the property. You can have the projecting section built as left or right handed. 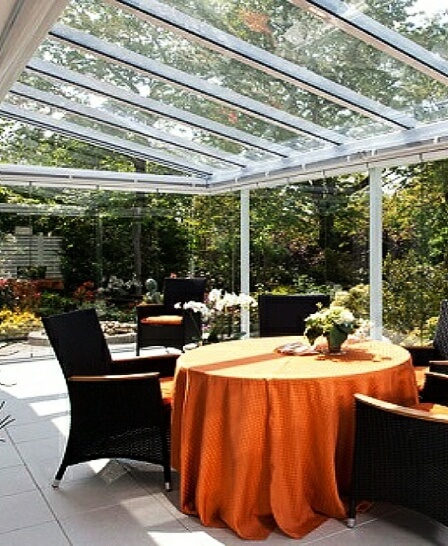 One other aspect to consider if you are building a larger conservatory or one with a solid roof is planning permission. There is some more info on that subject on our FAQ’s. What type of material can you use for the frame & roof? 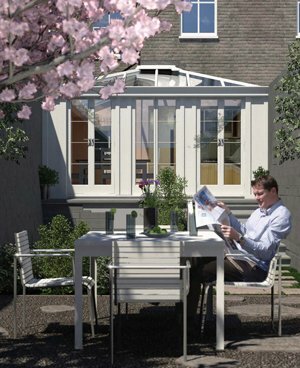 But most conservatory frames for domestic use are built from either timber, uPVC or aluminium. UPVC conservatories are hugely popular and the availability of suppliers is plentiful and the market is competitive so prices follow suit. Timber conservatories, especially those built form hardwood can be a fine addition to your home, but in general will cost more than an equivalent sized room made from uPVC. Aluminium conservatories used to be very bad, but in the 21st century, aluminium conservatory design has jumped forward greatly in terms of energy efficiency, life span and design. There are some superb aluminium conservatories around, but in terms of cost, you won’t find them in the “budget conservatory department”. Roof options include polycarbonate, fully glazed or solid roofing. With a recent trend of owners to go for tiled roofs for their conservatory. 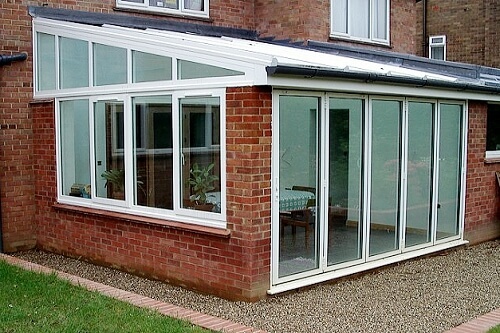 Tiled conservatory roofing will cost more than glass or polycarbonate options. How much do P Shape or Bespoke conservatories cost? Bespoke conservatories such a P-shape are notoriously difficult to price due to the large amount of variation of size, features and labour costs.